I had on our nation’s birthday. to do the job at hand." which has flowed over her from the beginning. our flag has always symbolized gumption and victory. I am thankful that God allowed me to be born here. rights, privileges, and responsibilities I have because of it. and praying for those who continue to walk the lines today. 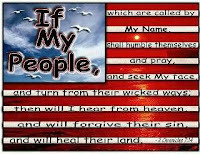 I will be praying we as a nation can pull ourselves together and regain our Christian edge and focus. 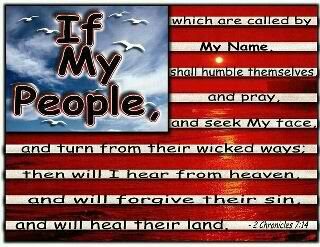 I will be praying we would return with vigor to our founding motto “One nation under God” instead of the motto “Whatever” which we seem to have adopted today. I will be praying our nation will once again become the godly example and spring board for other nations to be able to find their faith and freedom in the only One who truly has it to give. I will be praying the body of Christ can once again see the importance and power of prayer in fighting the good fight of faith. Prayer is not the last resort but the first line of defense. It is where our wisdom is established and our courage is maintained. What is your part in helping this nation fulfill its destiny? America cannot accomplish her purpose without each of us doing our part. When I finished, I notice the shape of the words formed a flask. who will do the will of the Father. Thanks Teresa! I really do love this country and want to see its greatness come forth in the days and years to come. Wonderful post! God amazes me when He gives you words to say and then even shapes them so they carry extra Spiritual meaning. You bless me. Thanks so much! And I was worried about posting while I was gone.....lol! Inspiring post, Mary Jane. Your writing blesses me as well. Thanks! I couldn't do it without all my writer friends. Thanks for all your support.